This is one of those good old fashioned tasting desserts. So refreshing, so simple. 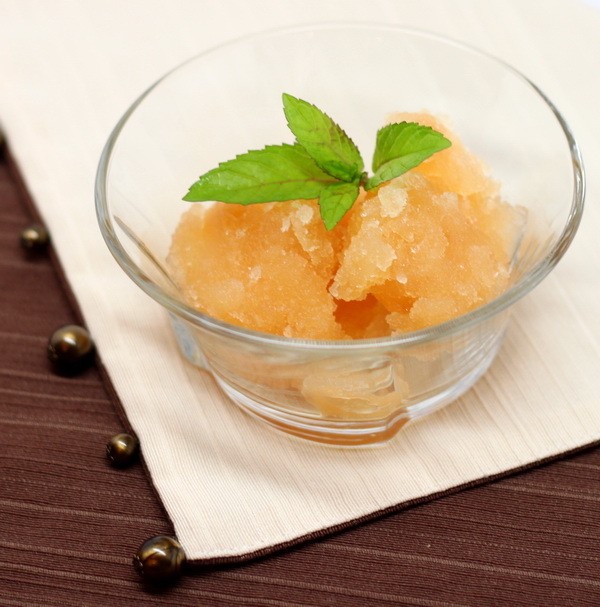 This mildly tart sorbet is great served with seasonal berries. Mix buttermilk, ¼ c sugar and corn syrup and place in an ice cream maker and freeze according to manufacturer instructions. 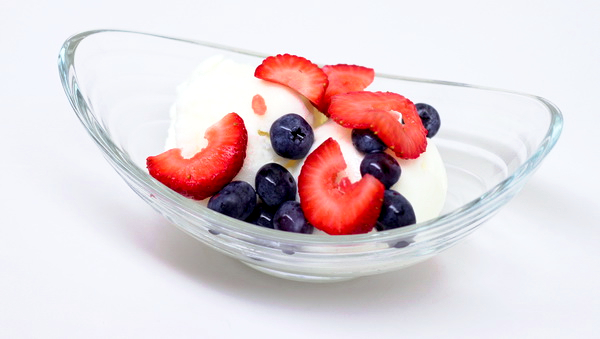 Freeze for an hour or until firm then place in serving bowls and cover with fresh berries. I recently got a Zoku Quick Pop Maker. BEST THING EVER ! I love making pops but hate the wait time. Now I have ‘em in 7-9 minutes 🙂 This is one of the recipes I pulled from the Zoku book – of course, I’ve tweaked many of the recipes to suit my own tastes, bring down calories, and to get creative with the pops, but some are in their original goodness. In a saucepan whisk chocolate, sugar, water and salt and cook until completely melted, about 5 minutes. Let cool about 10 minutes in the fridge and then whish in the milk and half and half. Then return to the fridge and cool completely (about ½ hour). 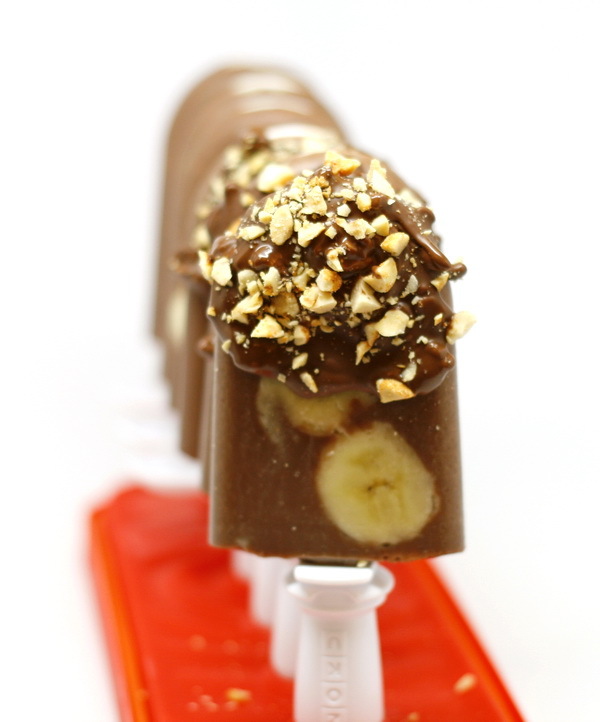 If you are using traditional molds, you can suspend the bananas by filling the molds half way. Freezing a bit, then adding the bananas and the rest of the mix. Or you can just let the drop to the bottom – it will still taste dandy ! Freeze 6 hours. This is sooooo refreshing. Between the tart lemon, the sweet tea and the cold, cold temperature, you’ll turn down the heat in any room when you serve this summery dessert. 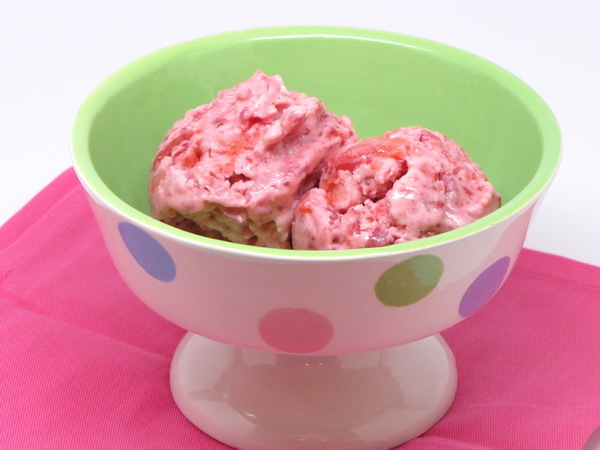 Place a metal bowl in the freezer to chill. 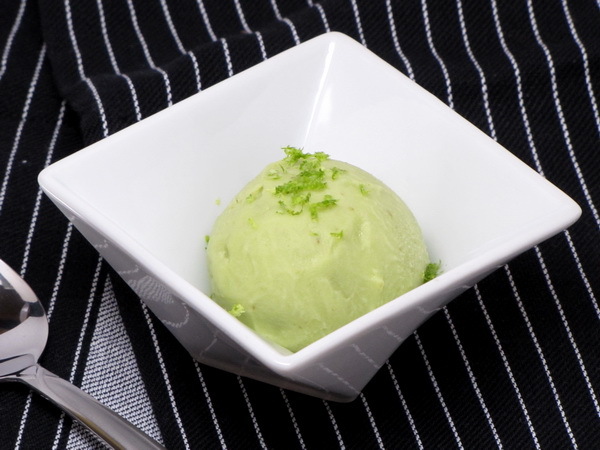 Combine ingredients and pour into the bowl and place in the freezer for 30 – 60 minutes. When ice crystals form on the edges, stir with a fork being sure to pull away all the frozen pieces around the edges and freeze another 2-3 hours stirring every ½ hour. Best to serve right after the initial freeze time, but if you let it sit overnight, be sure to defrost for 15 minutes or so before serving. These are sooooo easy to put together. Serve warm from the oven and you’ll have the family waiting in line for the sweet goodness of these perfect sweet rolls. Preheat oven to 375 degrees. 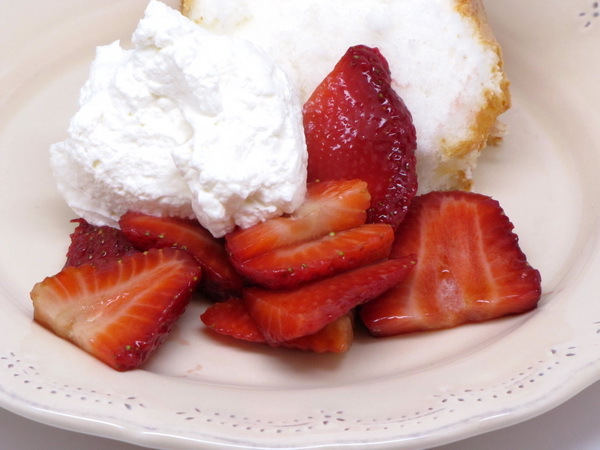 Spray a 9 inch round cake pan or a deep dish pie plate with Pam. Separate dough into individual rolls and place in pan – I do a circle around the edge with 8 rolls and 2 in the center. Starting ¼ inch in from the edges cut a deep X into the top of each roll then open slightly by pulling the dough toward the edges. Fill each with 2 t of the preserves. 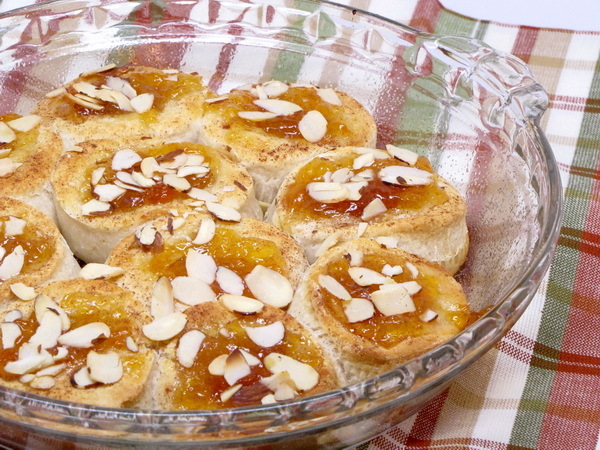 Sprinkle with sugar and cinnamon then sprinkle with almonds and bake ½ hour or until golden. Serve warm. Moist and flavorful ! This is like eating a super moist cupcake with a piece of cheesecake thrown in for good measure. Preheat oven to 350 degrees. Mix cake batter as directed then add in pudding mix and pumpkin. Spoon into 24 paper lined cups. 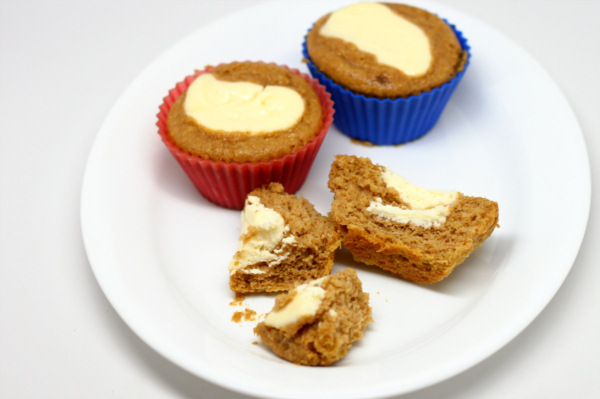 Beat cream cheese with sugar and egg and spoon over the batter. Bake 20 minutes or until a toothpick comes out clean. Cool on wire racks. Refrigerate any uneaten portions. Even though I make these pops in a Zoku maker, you can make any of these recipes in traditional pop makers – each pop here is 2 oz. so adjust accordingly. And if you love pops like me, then do yourself a favor and get a Zoku 🙂 Their recipes turn out fantastic pops – I often skinny them up a bit, but I mostly use their measurements and basic recipe and am always pleased with the results. Combine the strawberries and milk in a blender until smooth and then press through a fine mesh sieve so you strain out the seeds – I usually run a spoon back and forth over the berries and that pushes the mix through the sieve pretty good. You should end up with ¼ c plus 3 T of seedless puree. Whisk in the sour cream, sugar, vanilla and cream. Whisk all ingredients until the sugar is dissolved. 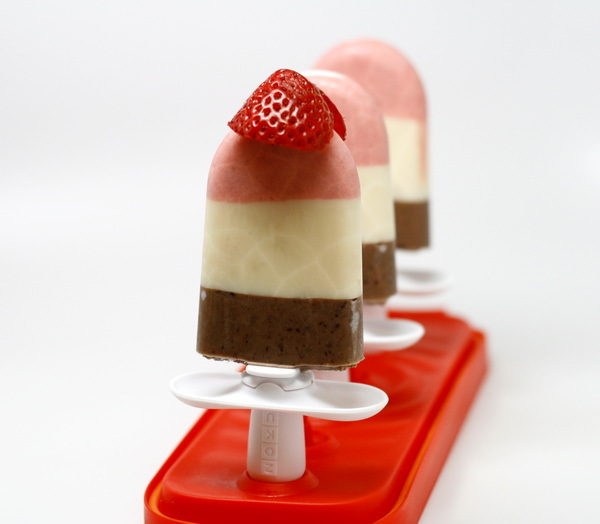 To make the pops in a Zoku, pour the strawberry layer 1/3 of the way up the mold and let freeze all the way. Then repeat with the vanilla and chocolate layers. In traditional molds, freeze each layer at least an hour before adding the next and then freeze the whole thing 6 hours. Toast the pecans in a skillet with the butter and sugar. Cook about 3 minutes stirring often. Let nuts cool completely. In a saucepan over low heat whisk water and butterscotch morsels and cook until melted, but don’t boil. Cool 10 minutes then stir in the half and half and vanilla and then refrigerate until completely cool, about 20 minutes. Whisk occasionally so that a skin does not form on top of the mixture. If you are using traditional molds, freeze 6 hours. 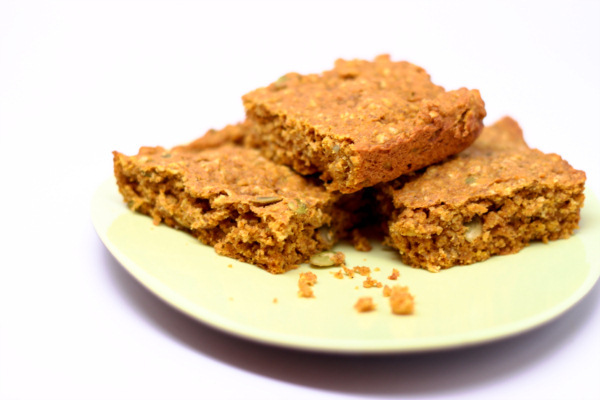 Rustic and homey – these pumpkin bars with pepitas are a great dessert for those who like desserts a little less sweet. Preheat oven to 350 degrees. Spray an 8×8 square baking pan with Pam. Combine flour, oats, baking soda, cinnamon, allspice and salt. Whisk together pumpkin. egg, oil, vanilla and sugar then stir pumpkin mix into the flour mix and stir in pumpkin seeds. Spread evenly into prepared pan and bake 20 minutes or until toothpick inserted in center comes out clean. Cool and then cut into 8 bars. Wrap bars individually and store in the refrigerator.